Now 13 years into the award program, this Cox Automotive accolade went to one of its own. Cox Automotive presented its annual Barbara Cox Woman of the Year Award to Ellie Johnson, general manager at Manheim Statesville, representing the first time in the history of the award that it has been given to a Cox Automotive team member. 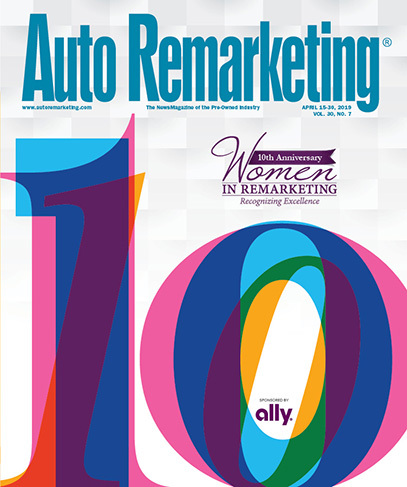 This honor is awarded to women who demonstrate business leadership and community advocacy, as well as a commitment to advancing the automotive industry. The award was presented by Cox Automotive president Sandy Schwartz during the Northwood University Dealer Education Award annual breakfast on Saturday at NADA Show 2018. The award is named after the late Barbara Cox, a Cox Automotive owner and the mother of chairman Jim Kennedy. Two of Barbara Cox’s grandsons, Henry Parry-Okeden and Andrew Parry-Okeden, were also there as Johnson received the award. Henry is a member of the Cox Enterprises board of directors and Andrew is a member of the Cox Automotive Australia advisory board. “Ellie is a shining example of this award, our company, and all women that have built their careers in the auto industry,” Schwartz said. “In her 30-plus years at Manheim, she has grown from working her family’s auctions to becoming a general manager. “Additionally, Ellie’s involvement with professional organizations, civic groups and charitable organizations is an incredible display of giving back and serving your local communities as a professional in our company. All of us at Cox Automotive are so proud of Ellie and her accomplishments,” Schwartz went on to say. Johnson has a lifetime of experience in the auction profession, with her father being an auctioneer and founding his own auction facility. After earning an accounting degree and real estate broker’s license, Johnson joined her father’s business which is now known as Manheim North Carolina. She served as general manager of Manheim North Carolina until 2016 when she was named general manager of Manheim Statesville. Johnson is a former president of the National Auto Auction Association and is a member of the Carolinas Independent Automobile Dealers Association (CIADA) and the National Independent Automobile Dealers Association (NIADA). Among her many charitable endeavors, Johnson has her auctions sponsor local FHA and 4-H programs and annual food and toy drives. In 2017, the auction gave back over $68,000 to various charity programs. “This is an incredible honor for myself, my team and Cox Automotive,” Johnson said. “I am so blessed to work for Cox Automotive. It’s a family-owned business with the same values as the one my family started over 30 years ago. Johnson is a five-time winner of the Santander Consumer USA and Chrysler Capital Asset Remarketing Awards for her work at Manheim North Carolina. In addition to presenting the award to Johnson, Cox Automotive presented a $10,000 Barbara Cox scholarship to Mollie Arnold, a Northwood University junior studying Automotive Retail Management. Arnold is a Dean’s List student, volunteers in a number of organizations including Habitat for Humanity, St. Jude Up Till’ Dawn, and the Special Olympics, and is a Women’s Retail Network Scholarship recipient. For more information on the Barbara Cox Woman of the Year Award, visit this website.